Only bring ONE bag per person. Use soft luggage only - bags should be no longer than 28" - 30". 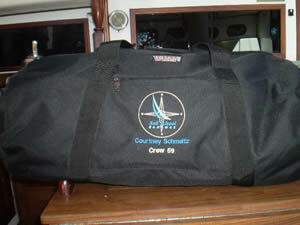 DO NOT bring suitcases as there is no space to store them on a sailboat. (If you choose to bring your own snorkeling gear you can pack it in a separate bag). For Scout groups, most Scouts travel in Class A uniform. It's in your own best interests to dress smartly when traveling! Don't over-pack, almost everyone who has taken part in our trips tell us they brought too much gear! Families can use this packing list as a general guide but it is primarily intended for reference by Scout and Student groups. There's no need to buy deck shoes. Most Captains don't allow shoes to be worn onboard. Most crewmembers are happy to go barefoot but if you must wear deck shoes onboard, you can't use them onshore as they will bring tar, oil and dirt back to the sailboat. If you are a Scout group don't bring any electronic gaming or music devices. Don't bring bulky items like Skateboards, Roller Blades, etc. as there's nowhere to store them onboard.